I think that the ale surprise the people in New York cuz that state wants that whale out of that ocean because they don't want the whale do to damage.and its huge and may kneed over boats and ships that go on the ocean. I think it would be cool to see a whale from a boat but I would also feel nervous. In case it gets angry and blows the water or tries to jump out. I would have felt kinda strange that their getting close to new York because normally people go there to see big building and artist and not whales. Humpbacks invited New Yourk. I think that its not that bad. I Think its really cool that theirs humpbacks around the city. 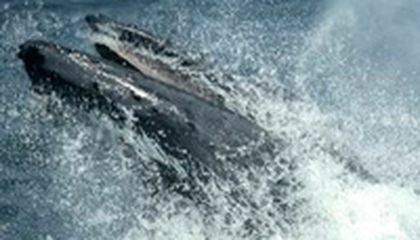 I think that people will go to New Yourk just to see the humpbacks and to have a really good time with there family. scientist don't know how many whales there are in the world because one , earth is 75% water. two, whales swim pretty deep in the ocean , and three how many scientist really want to go that far out into the ocean and count the population of whales knowing all the risks that come. This is vary interesting . Some people think its because the water is cleaner. I think part of it is that and there are more and more of them coming to life. 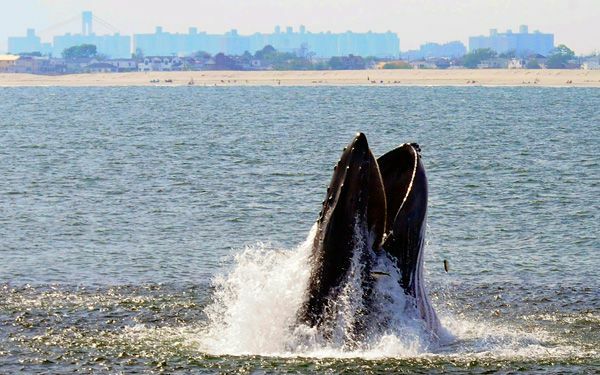 Hump back whales are invading the waters of New York. I don't think this is a problem . They believe they are doing this because the water is cleaner. if the water is better for them there then where they organially where then I think they should go to where its better. Humpbacks migrating to New York might not be such a bad thing. Scientists and Marine Biologists might be able to help the species more and keep them from becoming extinct. I probably would of had a heart attack if I was swimming and saw a whale pop out of the water. That actually happened to me one time while I was at the beach, I got out of the ocean and went into my hotel room. When I got up there I looked out the window, and exactly where I was swimming was killer whales. Now I'm to scared to get back into the ocean. The International Whaling commission doesn't know how many whales there are world wide because they can only know the amount of whales they tagged and documented. Every whale in the world is not documented so therefore the International whaling commission doesn't know exactly ho0w many whales there are in the world. They don't know when a whale is born or when a whale dies. So they cant calculate how many whales are in the world today.